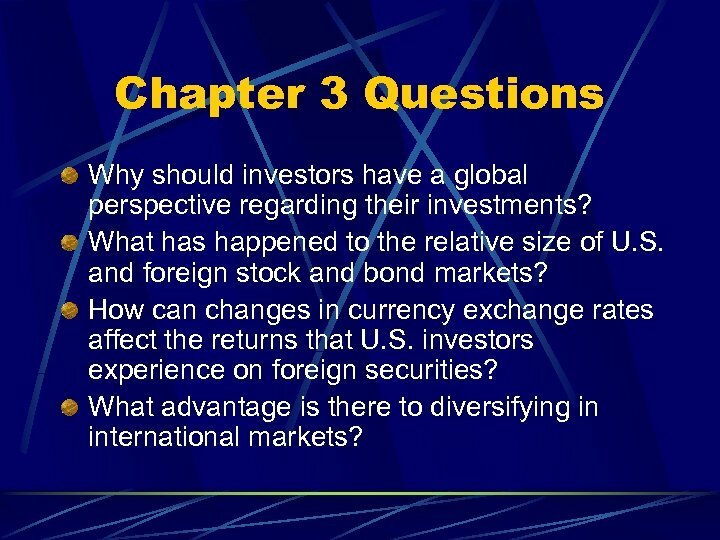 Chapter 3 Questions Why should investors have a global perspective regarding their investments? 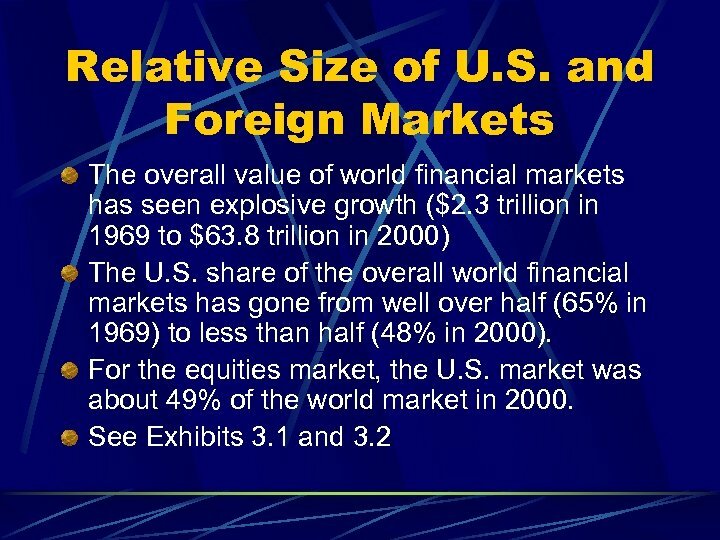 What has happened to the relative size of U. S. and foreign stock and bond markets? How can changes in currency exchange rates affect the returns that U. S. investors experience on foreign securities? What advantage is there to diversifying in international markets? 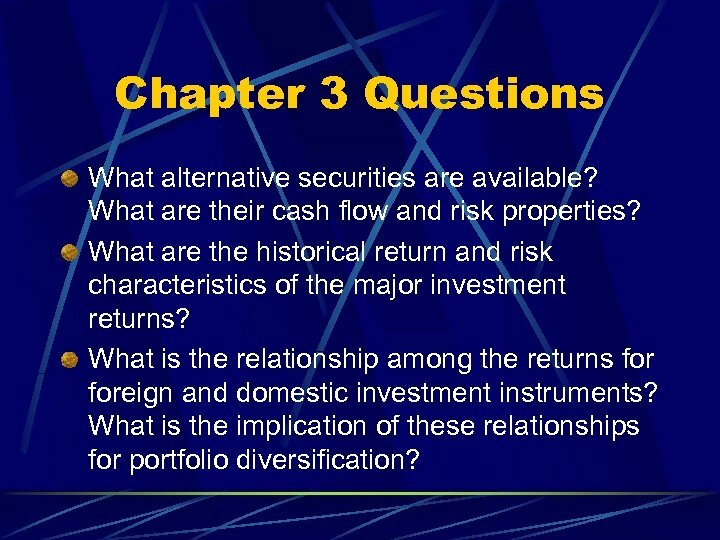 Chapter 3 Questions What alternative securities are available? 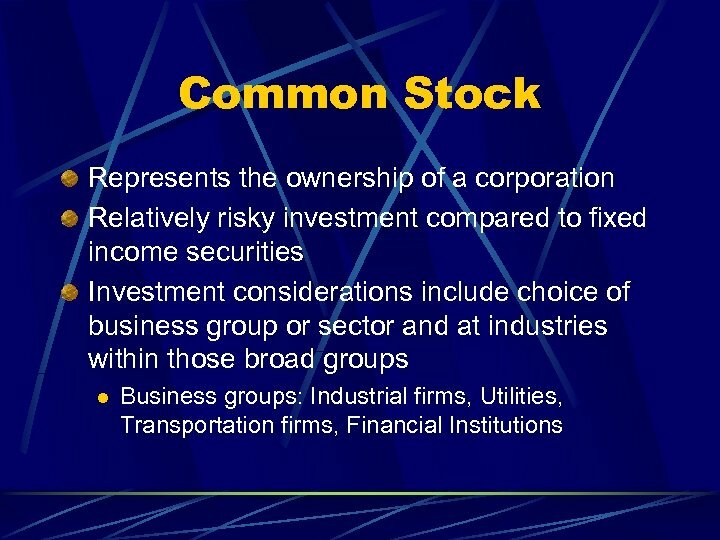 What are their cash flow and risk properties? 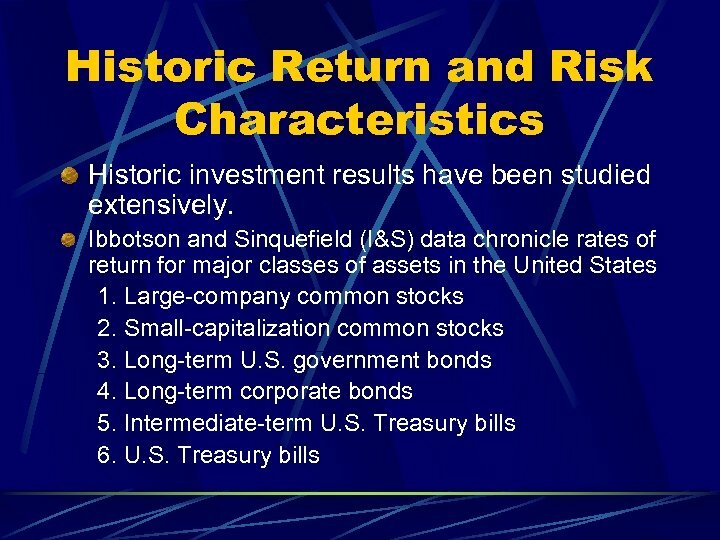 What are the historical return and risk characteristics of the major investment returns? 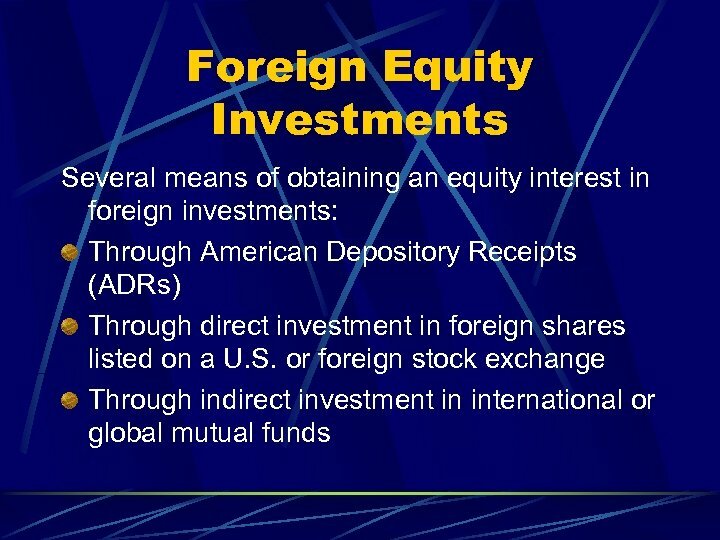 What is the relationship among the returns foreign and domestic investment instruments? 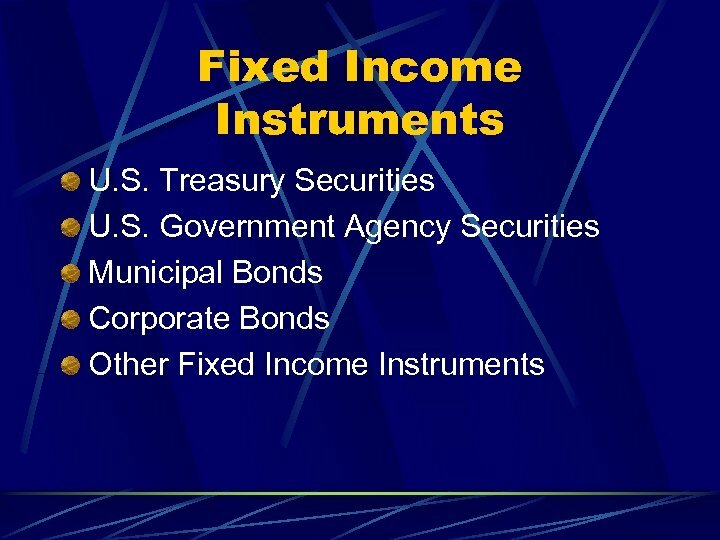 What is the implication of these relationships for portfolio diversification? 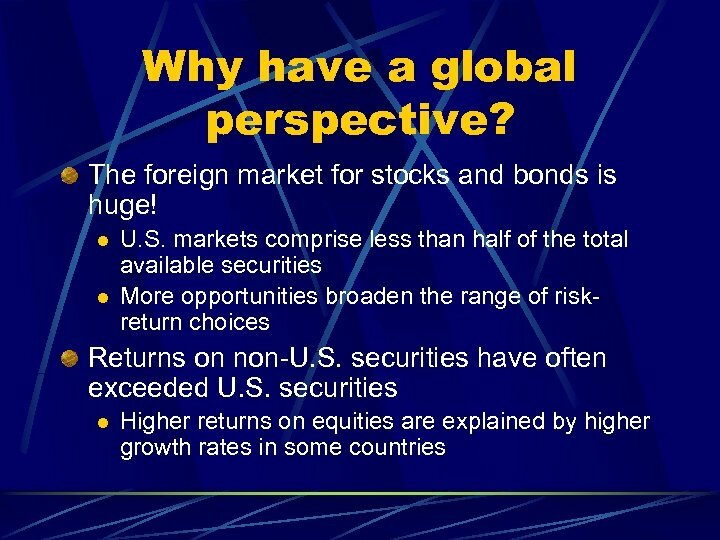 Why have a global perspective? 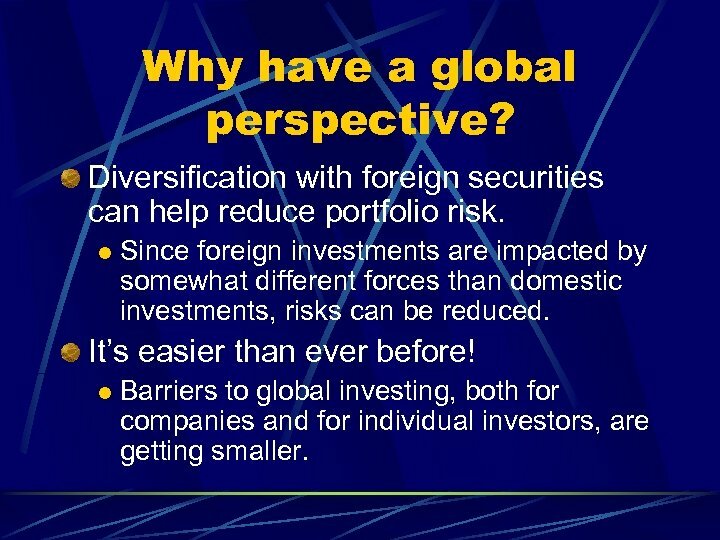 Diversification with foreign securities can help reduce portfolio risk. 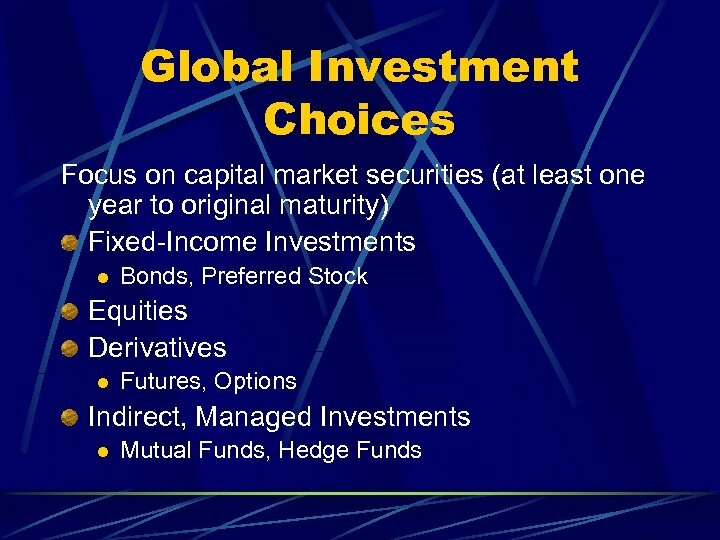 l Since foreign investments are impacted by somewhat different forces than domestic investments, risks can be reduced. It’s easier than ever before! l Barriers to global investing, both for companies and for individual investors, are getting smaller. The Effect of Changing Exchange Rates For U. S. investors, a foreign security’s return in its domestic market is not the “bottom line. 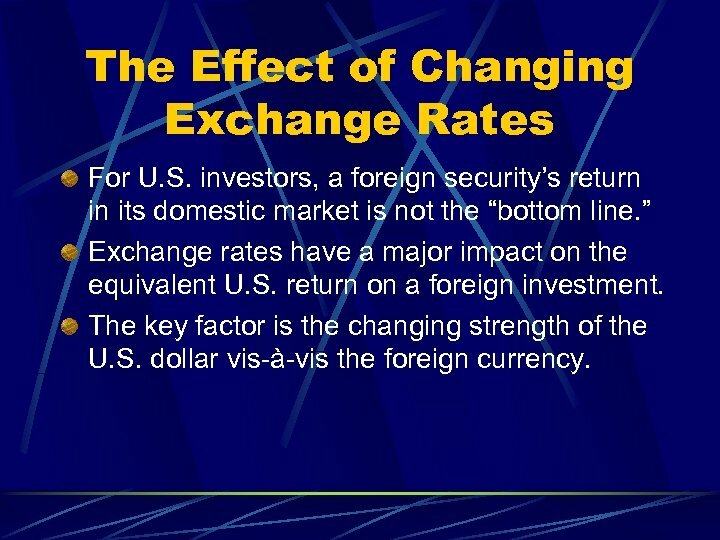 ” Exchange rates have a major impact on the equivalent U. S. return on a foreign investment. The key factor is the changing strength of the U. S. dollar vis-à-vis the foreign currency. 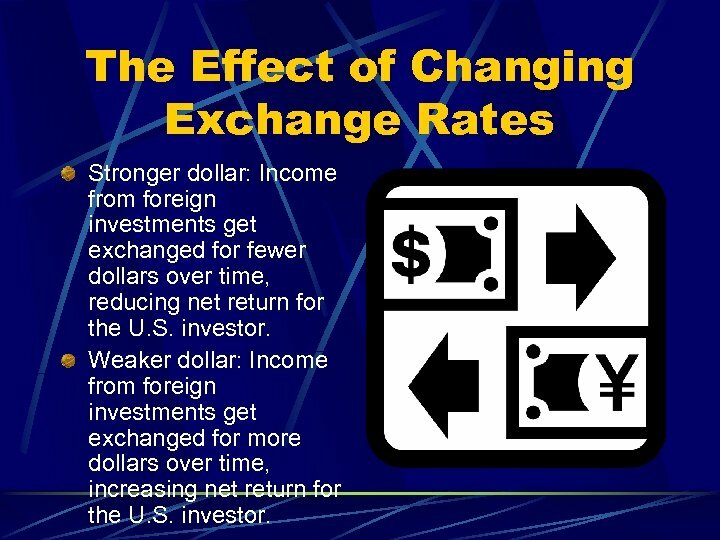 The Effect of Changing Exchange Rates Stronger dollar: Income from foreign investments get exchanged for fewer dollars over time, reducing net return for the U. S. investor. Weaker dollar: Income from foreign investments get exchanged for more dollars over time, increasing net return for the U. S. investor. 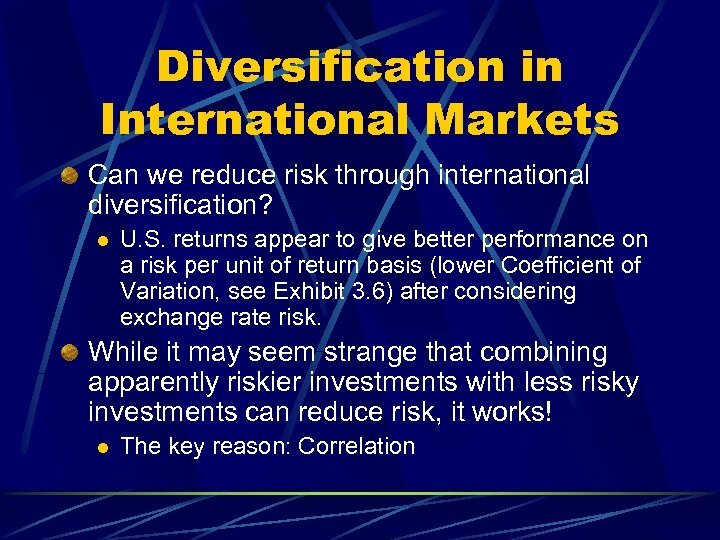 Diversification in International Markets Recall that diversification involves risk reduction. l l l Correlations range from +1 (perfect positive correlation) to – 1 (perfect negative correlation) By combining securities whose returns are not perfectly positively correlated with each other in a portfolio, the portfolio standard deviation characteristically falls. 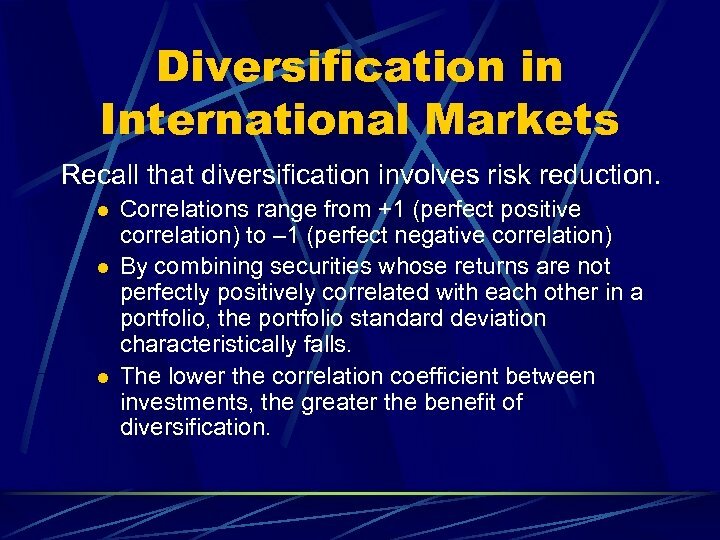 The lower the correlation coefficient between investments, the greater the benefit of diversification. 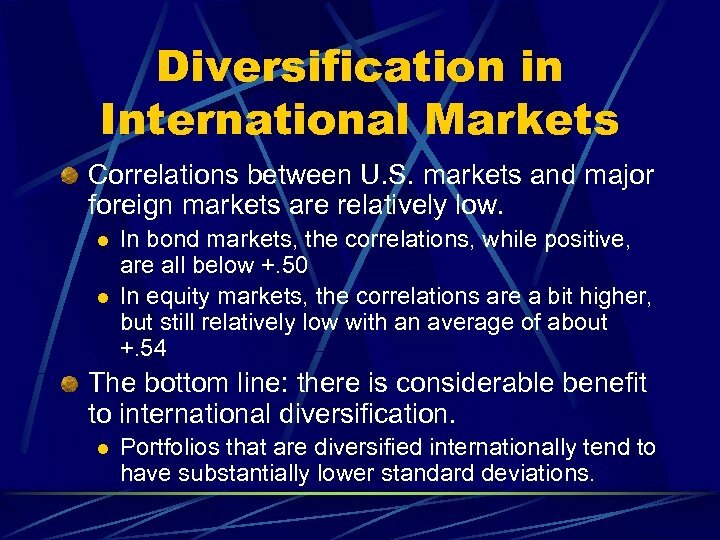 Diversification in International Markets Correlations between U. S. markets and major foreign markets are relatively low. 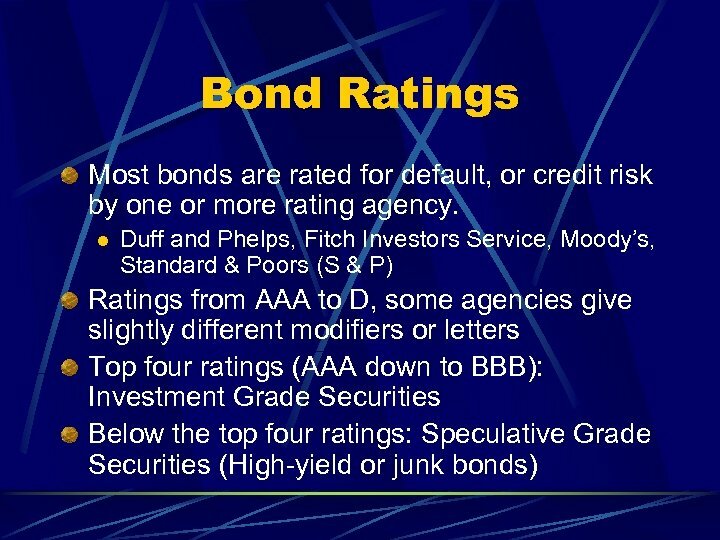 l l In bond markets, the correlations, while positive, are all below +. 50 In equity markets, the correlations are a bit higher, but still relatively low with an average of about +. 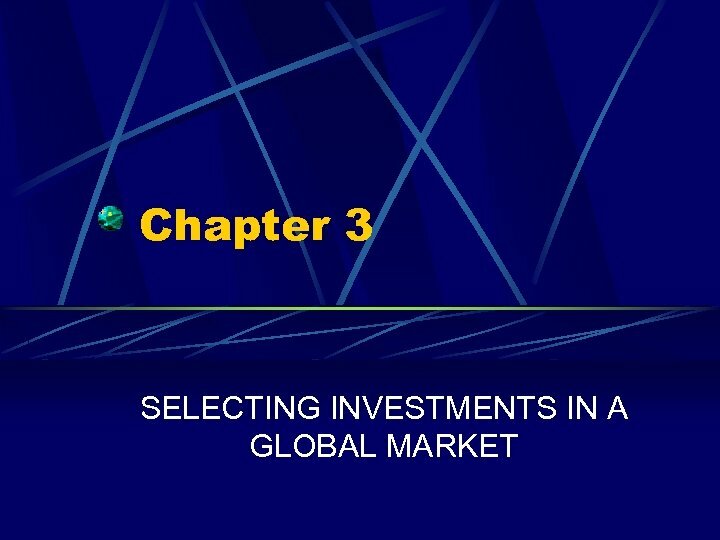 54 The bottom line: there is considerable benefit to international diversification. 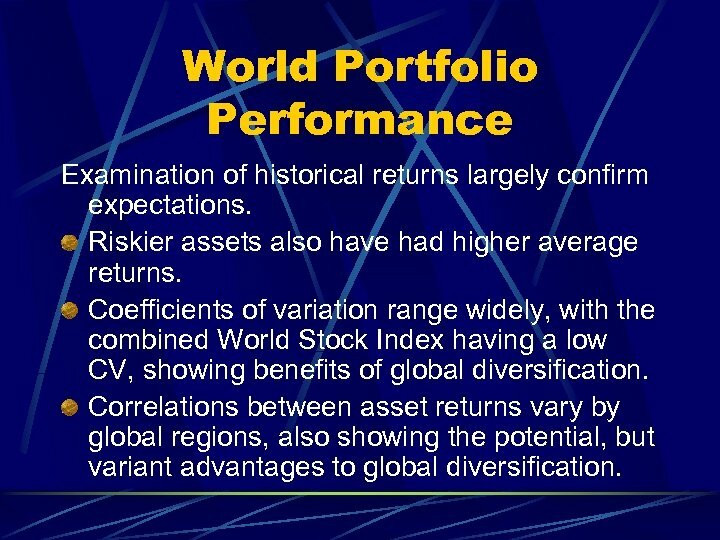 l Portfolios that are diversified internationally tend to have substantially lower standard deviations. 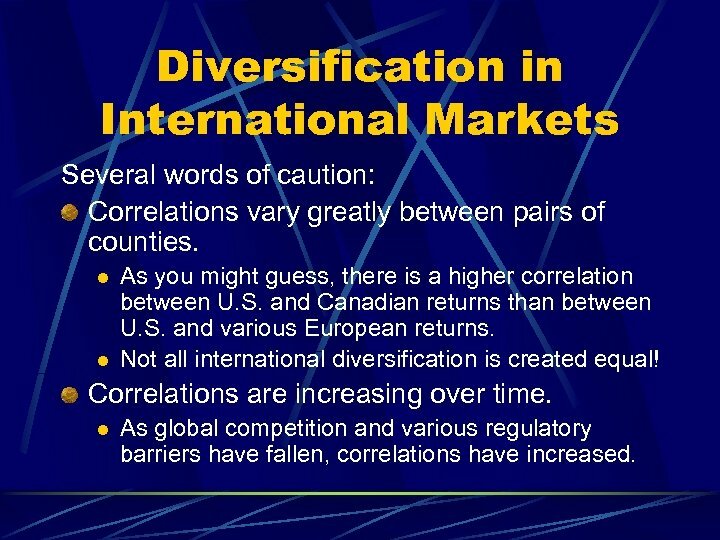 Diversification in International Markets Several words of caution: Correlations vary greatly between pairs of counties. l l As you might guess, there is a higher correlation between U. S. and Canadian returns than between U. S. and various European returns. 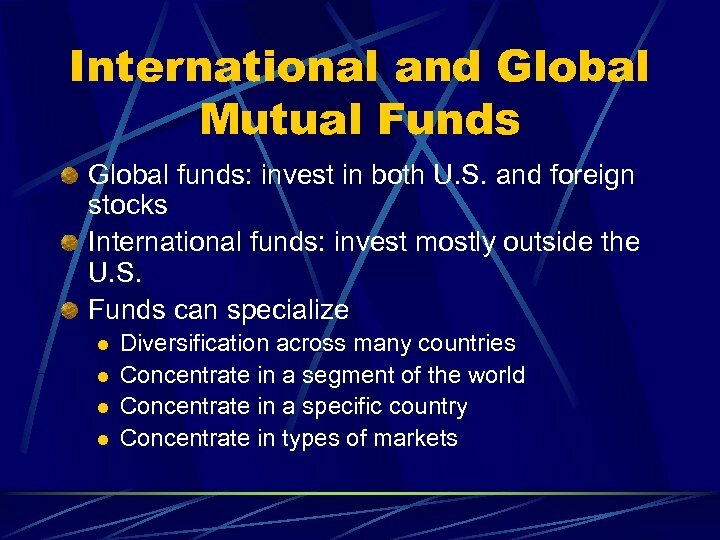 Not all international diversification is created equal! Correlations are increasing over time. l As global competition and various regulatory barriers have fallen, correlations have increased. 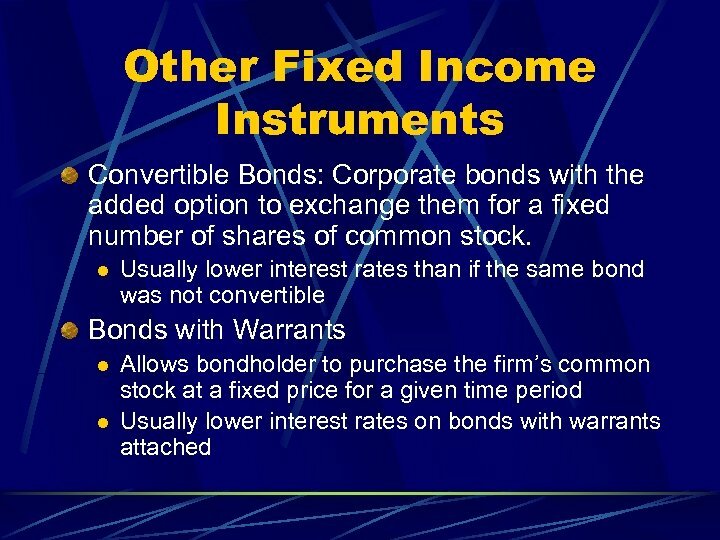 Fixed Income Investments Except for preferred stock, fixed income securities are debts of the issuer. 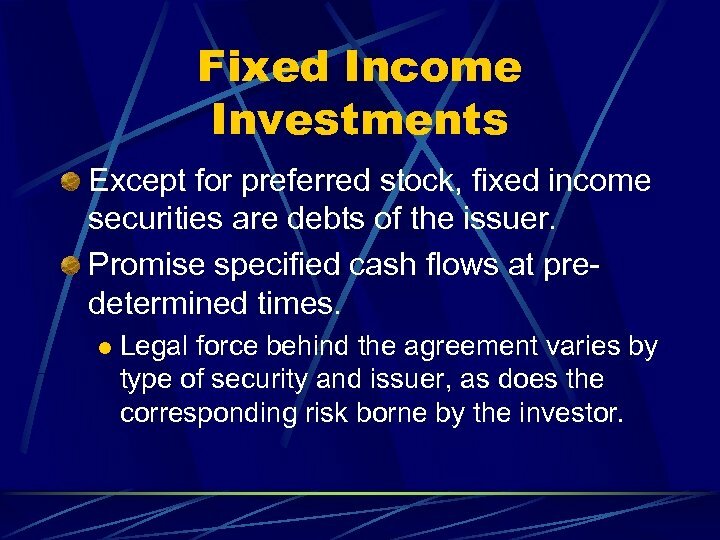 Promise specified cash flows at predetermined times. 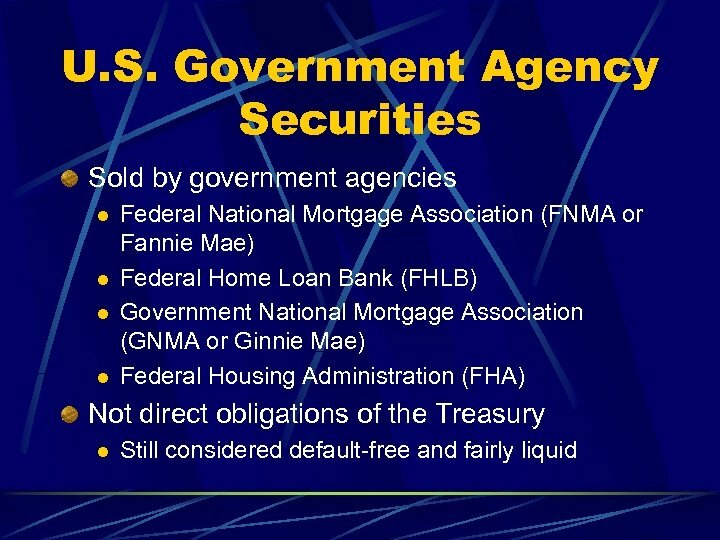 l Legal force behind the agreement varies by type of security and issuer, as does the corresponding risk borne by the investor. 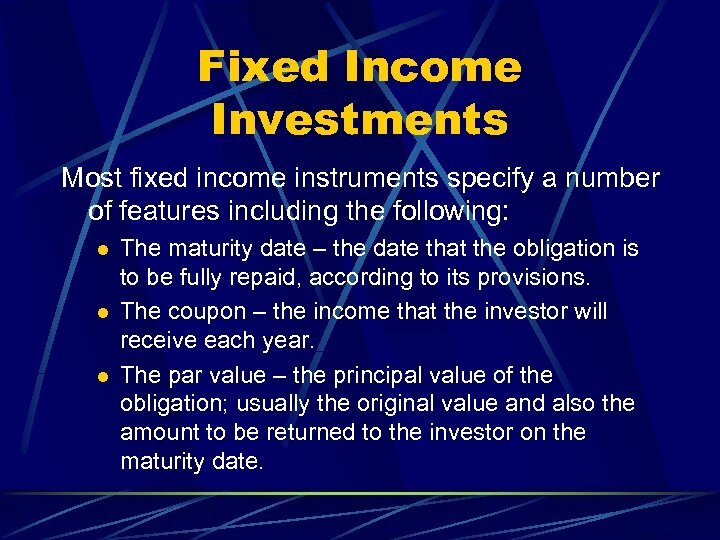 Fixed Income Investments Most fixed income instruments specify a number of features including the following: l l l The maturity date – the date that the obligation is to be fully repaid, according to its provisions. The coupon – the income that the investor will receive each year. 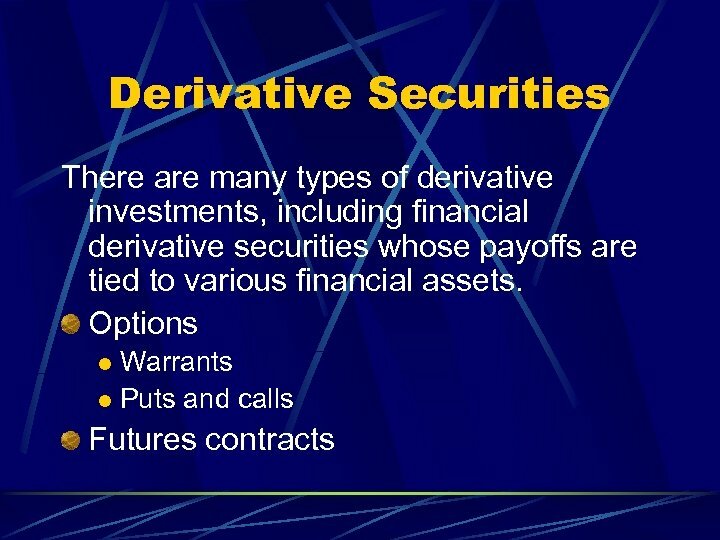 The par value – the principal value of the obligation; usually the original value and also the amount to be returned to the investor on the maturity date. 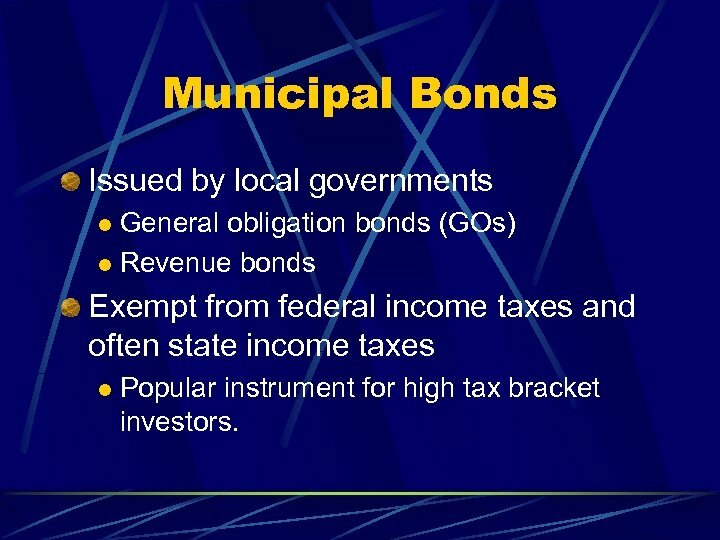 Municipal Bonds Issued by local governments General obligation bonds (GOs) l Revenue bonds l Exempt from federal income taxes and often state income taxes l Popular instrument for high tax bracket investors. 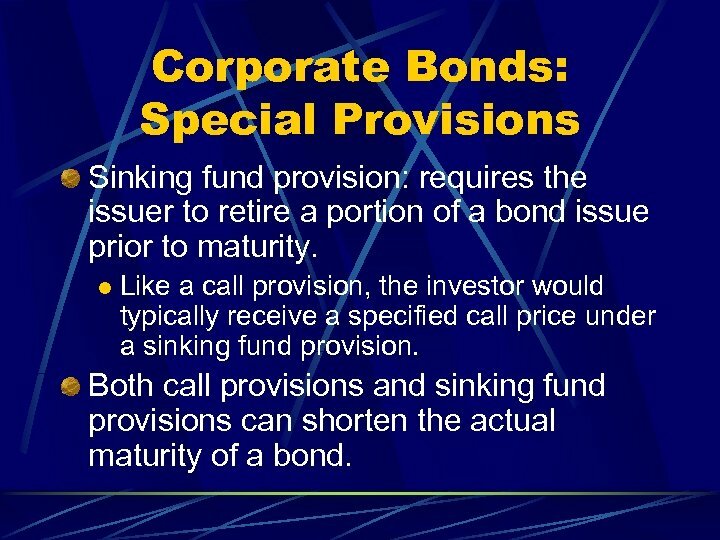 Corporate Bonds: Special Provisions Sinking fund provision: requires the issuer to retire a portion of a bond issue prior to maturity. 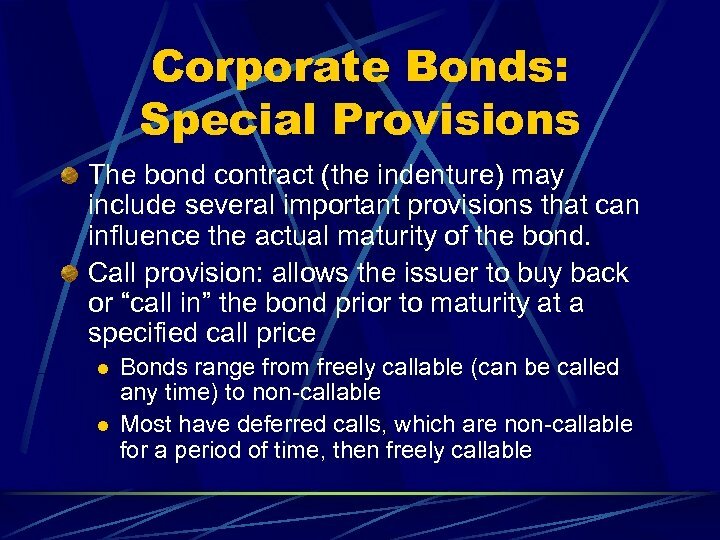 l Like a call provision, the investor would typically receive a specified call price under a sinking fund provision. 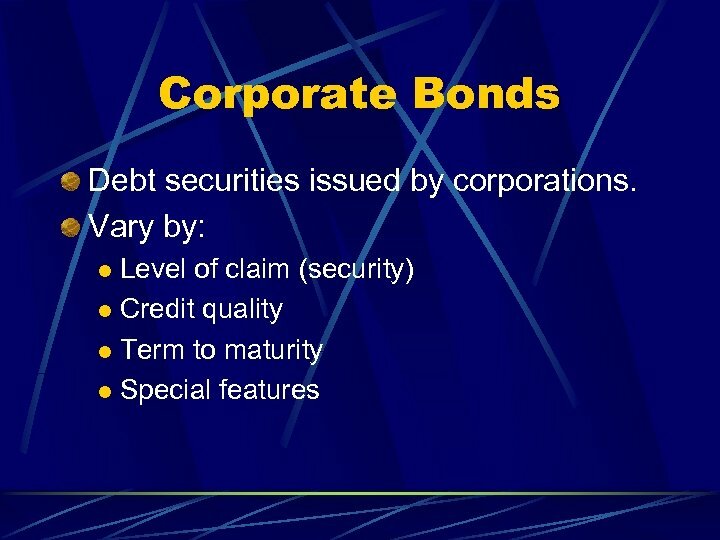 Both call provisions and sinking fund provisions can shorten the actual maturity of a bond. 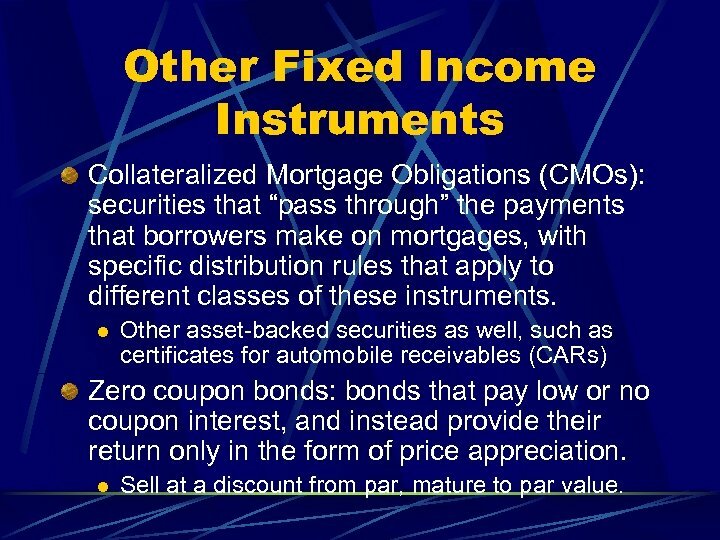 Other Fixed Income Instruments Collateralized Mortgage Obligations (CMOs): securities that “pass through” the payments that borrowers make on mortgages, with specific distribution rules that apply to different classes of these instruments. 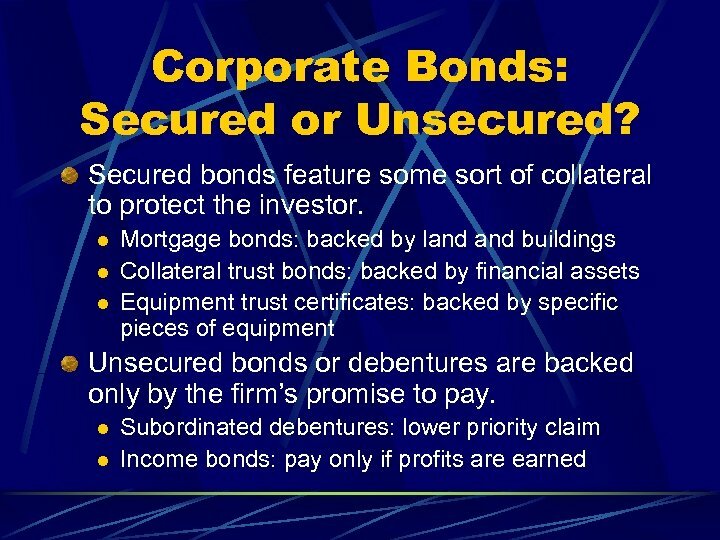 l Other asset-backed securities as well, such as certificates for automobile receivables (CARs) Zero coupon bonds: bonds that pay low or no coupon interest, and instead provide their return only in the form of price appreciation. l Sell at a discount from par, mature to par value. 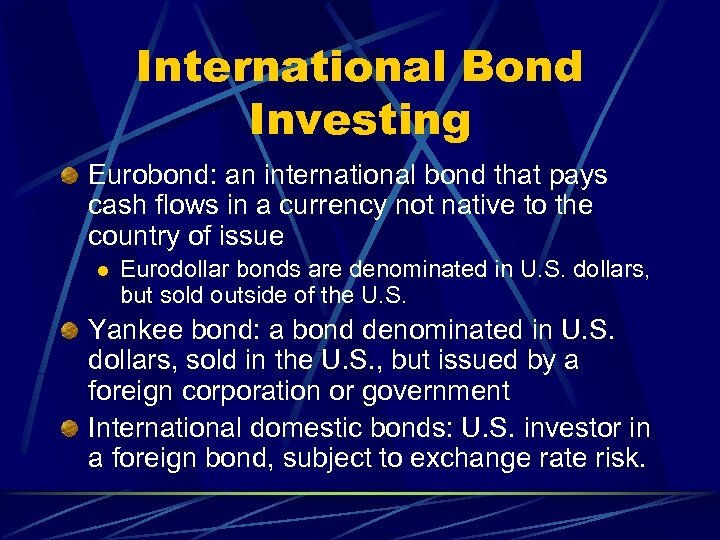 International Bond Investing Eurobond: an international bond that pays cash flows in a currency not native to the country of issue l Eurodollar bonds are denominated in U. S. dollars, but sold outside of the U. S. Yankee bond: a bond denominated in U. S. dollars, sold in the U. S. , but issued by a foreign corporation or government International domestic bonds: U. S. investor in a foreign bond, subject to exchange rate risk. 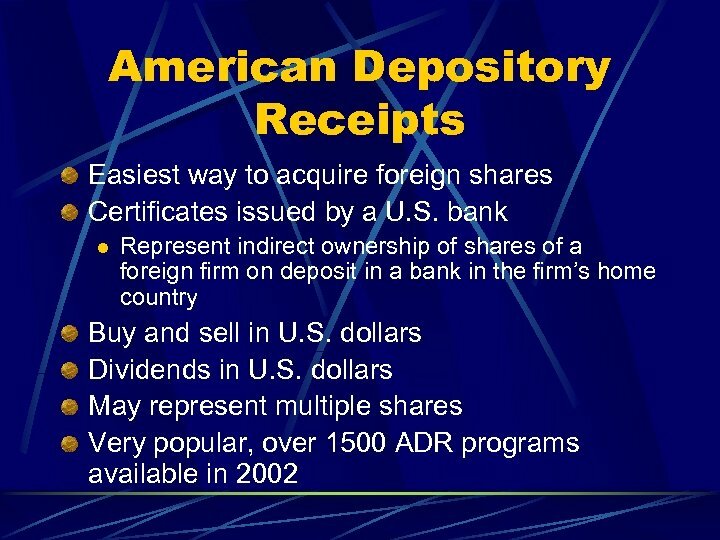 Direct Investment in Foreign Shares The most difficult approach, especially when purchasing stock in the foreign country (in the foreign currency) and transferring back to the investor’s home country. 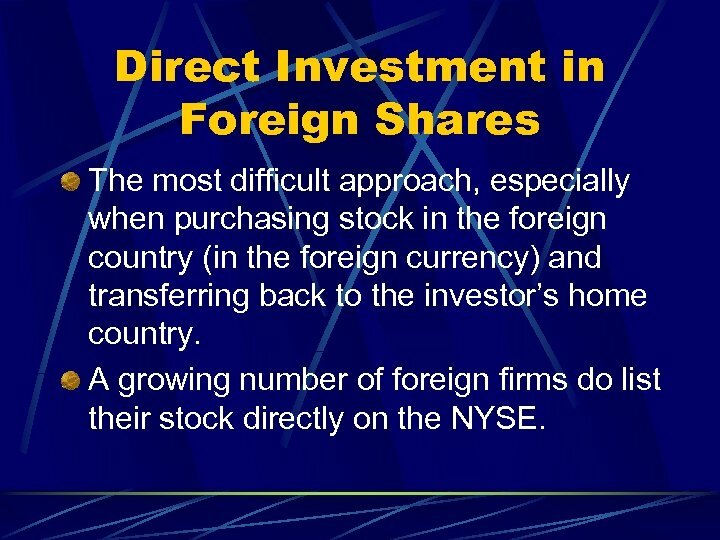 A growing number of foreign firms do list their stock directly on the NYSE. 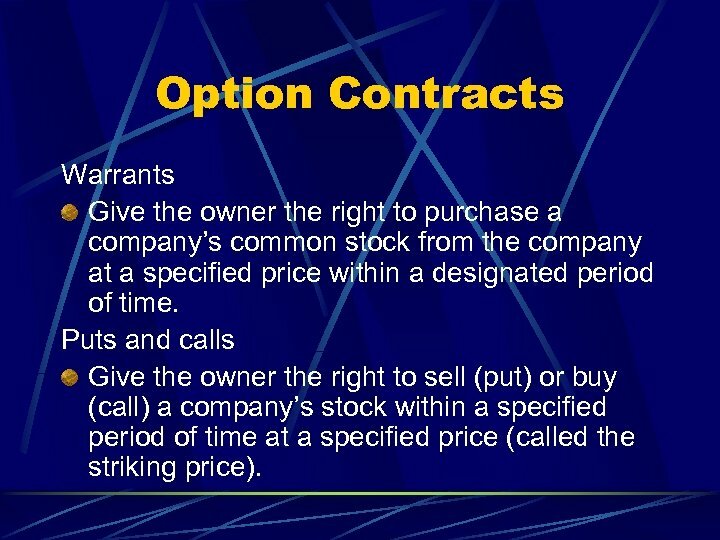 Option Contracts Warrants Give the owner the right to purchase a company’s common stock from the company at a specified price within a designated period of time. 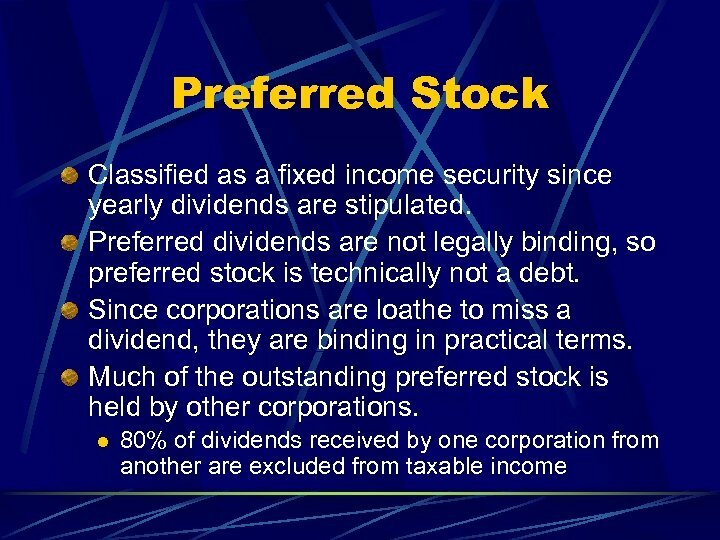 Puts and calls Give the owner the right to sell (put) or buy (call) a company’s stock within a specified period of time at a specified price (called the striking price). 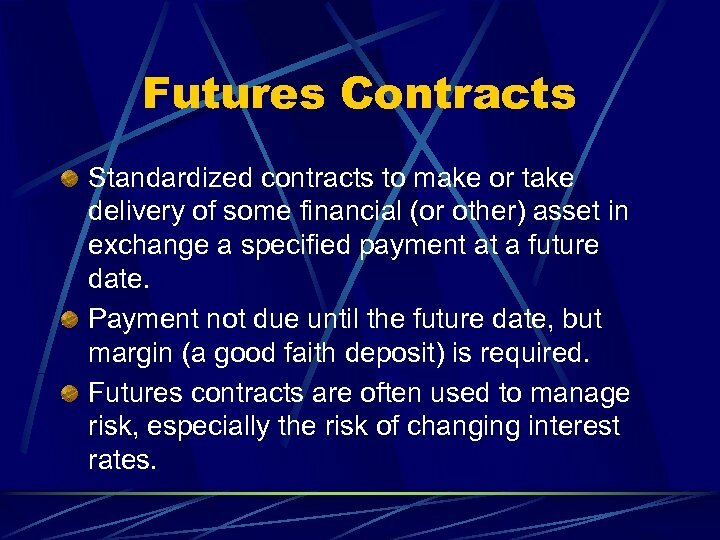 Futures Contracts Standardized contracts to make or take delivery of some financial (or other) asset in exchange a specified payment at a future date. Payment not due until the future date, but margin (a good faith deposit) is required. 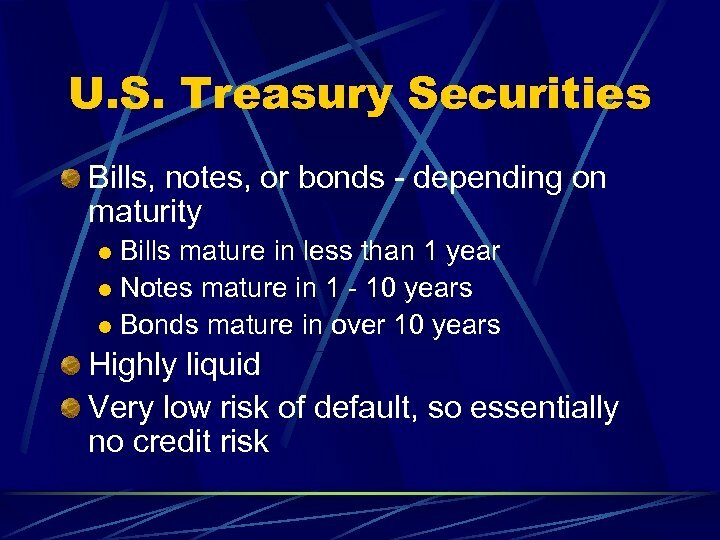 Futures contracts are often used to manage risk, especially the risk of changing interest rates. 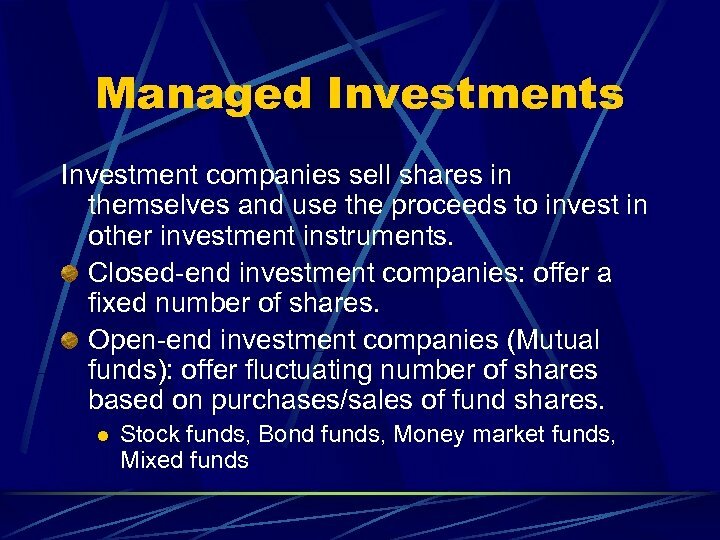 Managed Investments Hedge Funds: typically act as a partnership where one partner manages funds for all other partners according to some investment strategy. 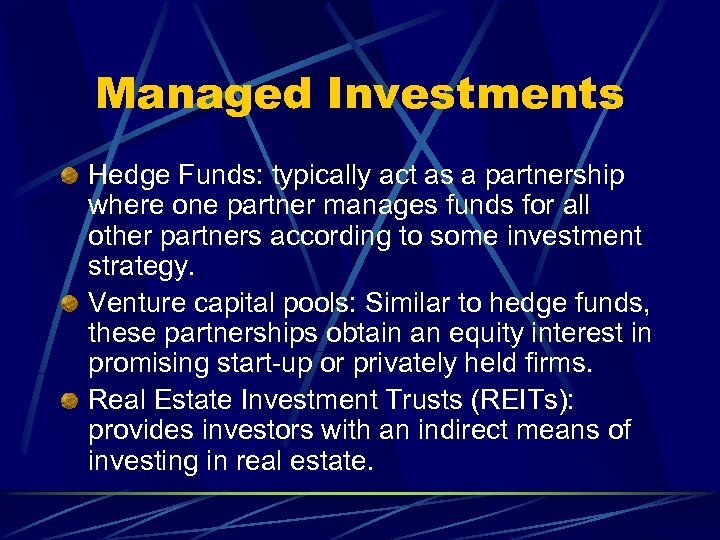 Venture capital pools: Similar to hedge funds, these partnerships obtain an equity interest in promising start-up or privately held firms. 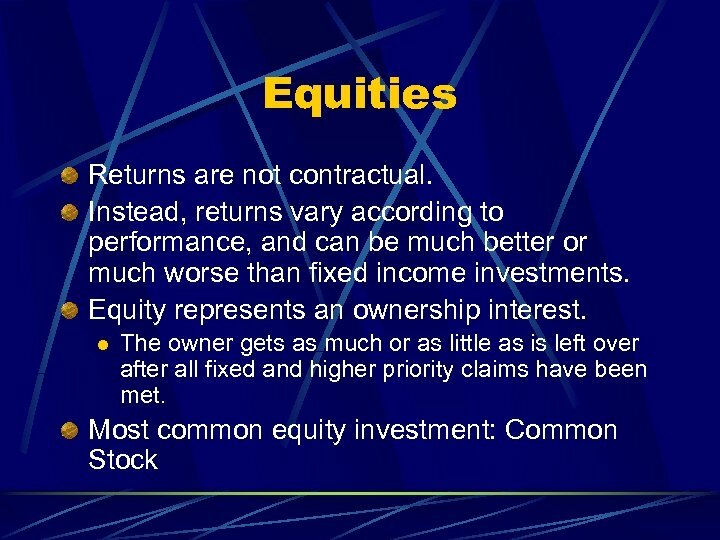 Real Estate Investment Trusts (REITs): provides investors with an indirect means of investing in real estate. 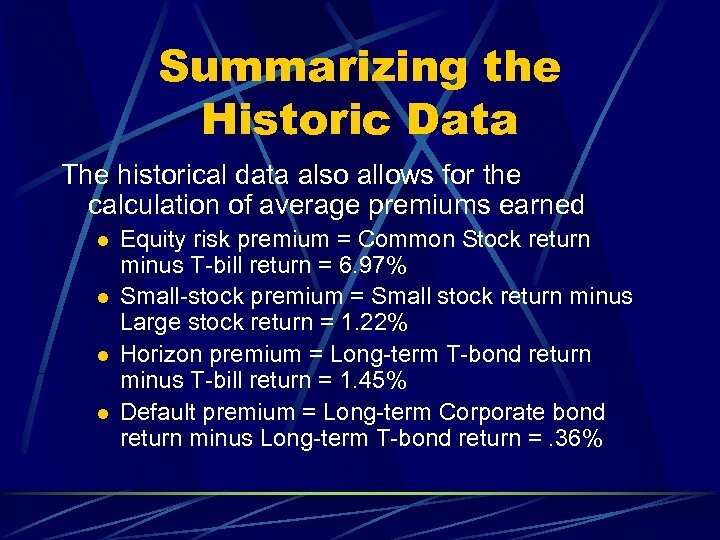 World Portfolio Performance Examination of historical returns largely confirm expectations. 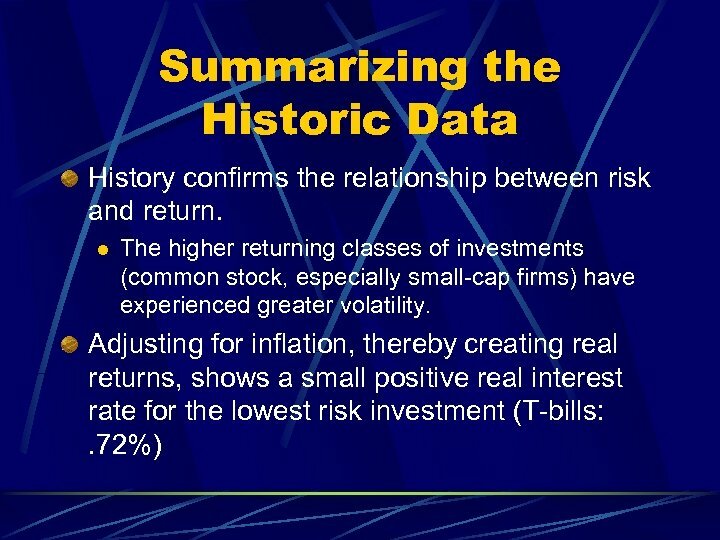 Riskier assets also have had higher average returns. Coefficients of variation range widely, with the combined World Stock Index having a low CV, showing benefits of global diversification. Correlations between asset returns vary by global regions, also showing the potential, but variant advantages to global diversification.